This year, I read a book about minimalism for the first time. 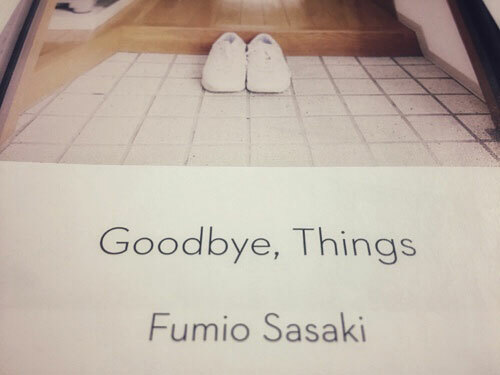 It’s called goodbye, things by Fumio Sasaki. It was recommended by Nina of The Minimalist Ninja. I’m thrilled to heed her advice. Within a week, I finished the book that I borrowed from the library. On the first few parts of the book, Sasaki added photos of some stuff of minimalists from Japan. Replacing a TV with virtual reality. Becoming a digital nomad with one backpack. I love seeing gears; maybe I can use some of those on my minimalism journey. Can I say it again. I love all the photos. The before and after photos are inspiring. Who would have thought that adding images would be such a treat, yet it does make sense. The book is somewhat a memoir of Sasaki’s life as an editor and stumbling upon minimalism which has a huge impact in his physical and mental health. It shows that minimalism isn’t just a trend that would go away someday. It’s a way of life that enables us to do more with less. The key takeaway for me is gratitude is happiness. When nonessentials no longer cluttere our life, we can see clarity and be grateful for what we have, the things that truly matters such as quality time and energy that are limited. I entertained the idea of having a tenugui (Japanese towel) and futon which are gaining attention in the West. But I can’t have a house without a tape which is essential in wrapping balikbayan boxes. Office supplies have tremendously decline in numbers in my study table but I’m not too gung ho about collecting scented stationeries anymore, like I used to do in elementary. Minimalism isn’t a competition of who can survive with so little stuff in life. That what makes me sad when I watch videos and read the comments (this become a habit and essential just as the content) about he/she is not a bona fide minimalist. While others have chosen to live with less stuff like the digital nomad, it doesn’t mean that everyone should do the same. To each his own. Minimalism teaches us to know ourselves and (hopefully) respect others. So I’m giving away some books and keeping my office supplies because they spark joy. Tip: If you find it hard to part with your stuff, give it away in batches whenever you are ready to let go. But don’t wait for the perfect time. It doesn’t exist. Before I write this blog post, I discarded some photos. I kept my 5 favourite photos. Maybe someday I’ll have to say goodbye. Maybe. Although I wanted to read the book again, it may not happen so I copied some notes from the book. We can refer anytime to some of the tips from the book. My favourite tip is no. 12. Minimizing is difficult, but it’s not impossible. There are limits to the capacity of your brain, your energy, and your time. Discard the things you already forgotten about. There’s no need to stock up. Use a pickup service to get rid of your possessions. Our homes aren’t museums; they don’t need collections. Be social; be a borrower. Be quick to admit mistakes. They help you grow. Don’t buy it because it’s cheap. Don’t take it because it’s free. Discarding things can be wasteful. But the guilt that keeps you from minimizing is the true waste. If you’ve developed your minimalist skills, you can skip the “see you later” stage. Minimalism is freedom – the sooner you experience it, the better. Questions the conventional ways you’re expected to use things. Minimalism is not a competition. Don’t boast about how little you have. Don’t judge someone who has more than you. The desire to discard and the desire to possess are flip sides of the same coin. Take your time. Maybe for now minimalism is just a thought. But give it a try. One item a week as a start. Before the year ends, you’ll have more space and time in your life. And money. What are the things you had difficulty parting with? Any tips on how you get started.